I’m in the dissertation phase of my studies now and am gathering data for my study. Here in Hawaii we have the highest due process rates for special education in the country, with autism cases disproportionately higher than for other special education diagnoses. Because of the high level of litigation here, I wanted to learn what parents believe should constitute a Free and Appropriate Public Education, or FAPE for short, in Hawaii’s schools. It has been a privilege to interview parents, to learn about their struggles, hopes and dreams for their children and how when I ask them for their child’s best moments it’s not about winning a science fair or giving a speech to their school, but simple things like saying, “Mommy” or using the toilet independently. It’s about the things parents of typical children take for granted. What has also struck me, though, are the parents who believe autism is hopeless—that there is nothing that can be done to really help their child. They love their kids fiercely, there is no doubt about that, but they have heard the advice of the medical establishment that tells them acceptance or possibly institutionalization is really all that can be done for autism. It still shocks me that medical professionals can be so completely ignorant of a condition that affects so many. 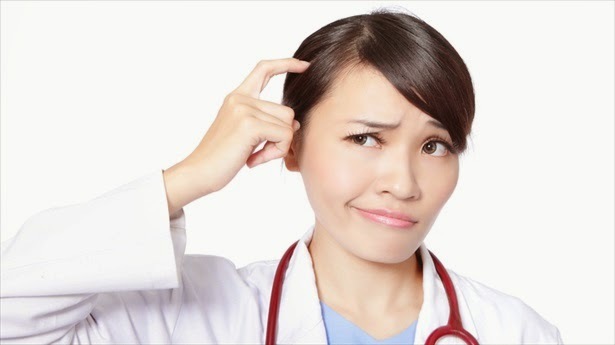 Don't let the white coat fool you...most doctors know next to nothing about autism. Because the medical community is so ignorant and disinterested in learning about autism, yet feels free to dispense “advice” about it, some parents simply don’t know what is normal, what is not and what symptoms can be mediated through diet and other non-invasive treatments. These doctors shrug, and whatever symptoms the child has—constipation, diarrhea, self-injury—are simply ignorantly explained away as “just the autism”. One mom I interviewed was obviously very devoted to her child, but when I asked if her son had gut issues, she told me, “No, he only (poops) once a week”, and was happy that he is skinny even though he eats a lot. 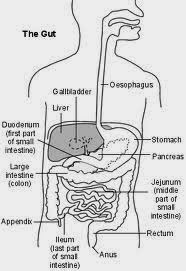 These responses screamed “Gut Problems” to me and the need for a good probiotic and digestive enzymes at a minimum. I asked about self-injury and she said, “No, but he picks at a spot on his hand…” and always has a scab there. Her doctor tells her these are just things that are normal for children with autism. Really? Here was a mom who clearly loves her son and tries very hard to do the right thing for him. She gets up early to drive him to a school that’s nearly an hour from her home because she thinks it offers better programs for her child, but she has had no help from modern medicine in treating her child’s gut problems, which have been shown to cause many of the behaviors we associate with autism. Because so many of our kids are non- or minimally verbal, these behaviors are the only means they have to communicate their pain. Imagine being in pain with no way to communicate it...this is what our kids endure. Dr. Margaret Bauman and Dr. Timothy Buie at Massachusetts General Hospital work with many autistic children and caution that hidden medical problems must be ruled out prior to placing an autistic child on powerful psychiatric medicines, which are popularly prescribed today for autistic kids to “reduce behaviors”. 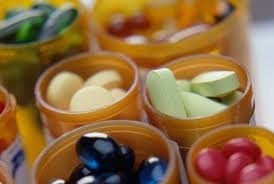 Imagine you are in agony with a stomach ulcer and your doctor prescribes Risperdal or Seroquel (a powerful anti-psychotic) for your treatment. You would find this entirely inappropriate, unprofessional, uncaring and downright absurd. 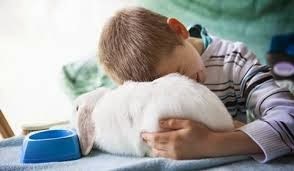 A reasonable person would probably consider it malpractice, as well…and yet these drugs are frequently prescribed to autistic children to reduce their problematic behaviors, and only serve to mask very real medical symptoms. I had the privilege of meeting Dr. Bauman when she came to Honolulu to speak several years ago. She showed us several clips of autistic children with disruptive behaviors that prevented the children from sleeping, sitting still or learning. One child was moving about and would not sit still at a desk and was rocking back and forth; another was bending over a table; another was self-injurious and was waving his hands in an undulating motion in front of his face; and the forth was thrashing about in bed—her mother said she engaged in this behavior every night as soon as she laid down. Just the autism, right? Nothing a few psychotropic drugs can’t take care of…then Dr. Bauman showed us the results of scoping procedures done on each of these kids. These pictures showed all four had severe ulcerations in their esophagus, small intestine and/or colon. These children were obviously in great pain. Imagine the distress at not being able to communicate the reasons for the odd postures or stims. In the case of the last child, lying down likely resulted in stomach acids to flow into her esophagus causing great pain. These behaviors were eliminated or greatly reduced when their cause was treated. It’s important to note that many behaviors associated with autism do not mimic those of the typical population in response to GI pain. The children aren’t putting their hands to their stomachs or throats in the case of reflux, so their GI tract distress may not be obvious. Ryan’s tummy was hurting him this weekend and he was slapping his head and throwing himself backward onto the couch. I can’t imagine giving him Risperdal or another anti-psychotic drug to treat pain, but this is done every day by the medical community. Parents who aren’t aware of the relationship between the gut and autism and who are anxious to relieve what they believe are psychiatric symptoms give these powerful drugs to their children, masking serious symptoms of disease—not mental illness. 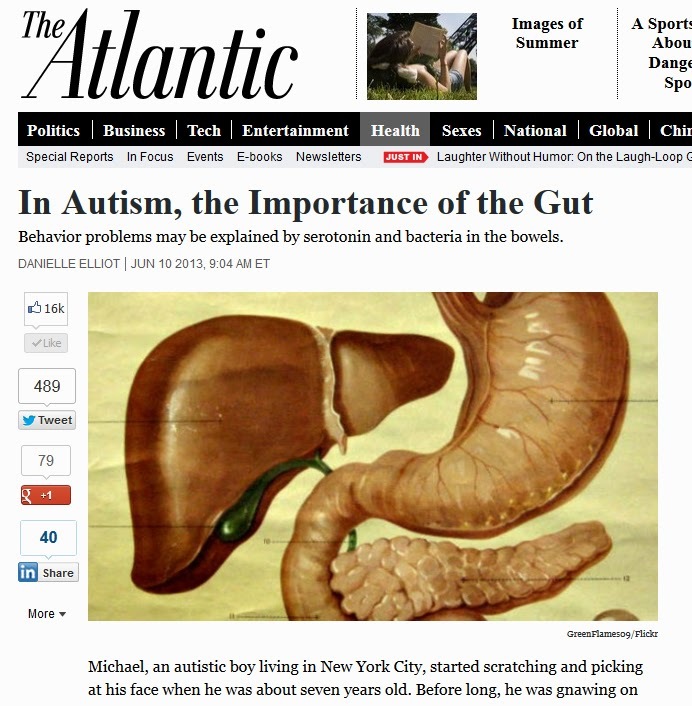 There’s a ton of medical research on gut issues in the autistic population, and yet the word has not trickled down to medical practitioners in significant numbers. I realize the need to curb violent or injurious behaviors, but wonder how many children’s very real medical problems have fallen through the cracks because of a lack of understanding, interest or knowledge by the people in white coats we call “experts”. Autism affects either 1 in 88 or 1 in 50 American children, depending on which study you believe. It’s hardly an orphan disease, and yet our medical doctors are woefully ignorant of autism and effective treatments. There are very real children in pain with families that struggle with how to help them. It saddens me to hear about children without words who suffer needlessly…and it angers me that those whose profession it is to heal are so quick to dismiss our children’s pain. If you know a child with autism who is banging his or her head, rocking (or engaging in other stim) or is self-injurious, think gut first. I am a legit high funct autistic adult who had gi issues. I was hospitalized recently at ucla hospital with a medium gi bleed and bad stomach pains. I also had non diabetes low blood sugar in january this year and almost died i was at lac usc in la for 3 days doctor not know what caused it thought to be pancrease tumor not found. I am only 23 years old to young for those. See doctor at these hospital they may help.